For someone with an impressive singing voice to overcome any real or self-imposed obstacles and become a professional, as in the case of Priscilla White, a number of factors (location, luck, timing) can speed up, slow down or stall the process. Doors could have opened for the hesitant Miss White sooner than her 20th year (though that's not bad!) had she not been working three jobs while still living in a cramped flat with her parents. She couldn't have known growing up in Liverpool would be the best possible place to launch a career in music, but it helped make up for the lag, as she often frequented night spots like the claustrophobic Cavern Club, where she witnessed rocking performances by John, Paul, George and Peter and another outfit led by a guy named Rory with a drummer named Ringo. Priscilla made friends with them all. Good move. Being about the same age as those up-and-coming local musicians, she and they were stricken by the same American rock and R&B acts. She somehow developed the nerve to go onstage at the Iron Door nightclub one night in 1961; Rory Storm and the Hurricanes played, she sang "Fever" Peggy Lee style, and before long any stage fright disappeared...well, almost...as she continued honing her vocal chops, just for fun, with local groups like Gerry and the Pacemakers and soon-to-be-disappointed drummer Pete Best's band The Beatles. But mostly she was an office typist by day who perkily served coffee some nights at the Zodiac Club and at one point functioned as a coat-checker at the Cavern. She began dating songwriting hopeful Bobby Willis while one creative undertaking landed on her resumé, that of a fashion writer for Mersey Beat, Liverpool's cool music mag; founder-editor Bill Harry, up against the week's print deadline, couldn't recall her exact name but knew it was a color and picked the opposite of her given surname. Cilla Black was the byline that permanently stuck, despite some flak from her dad once he caught wind of what was going on. Brian Epstein didn't plan on selling records over-the-counter or managing his family's NEMS (North End Music Stores) 'til retirement, as there were so many opportunities for a sharp, connected bloke like himself in the music management game. He began representing the Beatles and after much effort got them on the Parlophone Records roster, then did the same with Gerry's Pacemakers at EMI's Columbia label and Billy J. Kramer and the Dakotas at Parlophone, priming them all for what would be chart-topping pre-worldwide-hysteria in 1963 (he also succeeded in getting two less successful top-40-charting Liverpool acts, The Big Three and Tommy Quickly, on Decca and Pye, respectively). Early in 1962, before Liverpool became British music's designated hot spot, Cilla was introduced to Brian by John Lennon (it's said he called her "Cyril," typical of his propensity for word-twisting). Her nervousness kicked in as an audition backed by the Beatles went horribly downhill. She figured she'd blown it and resigned herself to simply working those various odd jobs. But she still sang in clubs when provoked and a chance meeting with Brian led to a less formal second audition and a contract with Parlophone. 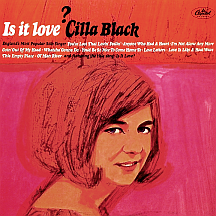 "Love of the Loved" was her first single, a Lennon-Paul McCartney song (the Beatles had recorded it as a demo, thus making the song a "reject" by Cilla's calculation) that slipped into the top 40 in the fall of '63. Pal Ringo called her "Swinging Cilla." She made several appearances on Juke Box Jury (the BBC's "rate-a-record" TV series), displaying a natural ease in front of the camera that did not go unnoticed; any anxiety she felt onstage (so many gazing eyes a few feet away!) vanished in comfortable surroundings with studio audiences. While on a business trip to the U.S., Epstein heard Dionne Warwick's hit version of Hal David and Burt Bacharach's "Anyone Who Had a Heart" and took it to Black/Beatles producer George Martin. The resultant track, a starkly "British" take on Warwick's unabashed "American" original, was equally brilliant and connected immediately, hitting number one in February 1964. This at the same time the Fab Four was visiting America, breaking TV ratings records and setting up the building blocks for dozens of their fellow Britons, including Cilla Black, to "come on over!" 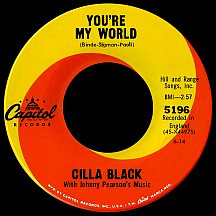 Cilla's signature song originated in Italy; "You're My World (Il Mio Mondo)," Umberto Bindi's hit from just months earlier, was given English lyrics by New Yorker Carl Sigman and returned Cilla to number one in May '64, coinciding with her appearance on the TV special Around the Beatles. Her touchingly romantic delivery, more subtle than its predecessor, became more of a global hit, timing perhaps one aspect of its top 40 placement in the U.S. on Capitol (her first single for the label) in July. The follow-up, "It's For You," went top ten in Britain. It seemed it couldn't miss in the States; McCartney had written it for her, using the "Anyone" smash as inspiration, and he played piano on the track, but it only reached the lower rungs of Billboard's pop chart. Using the same approach that had taken Warwick's tune to the top (and had worked wonders that fall for Sandie Shaw when she arrived at the apex with Bacharach and David's "(There's) Always Something There to Remind Me"), Cilla covered "You've Lost That Lovin' Feelin'," the Barry Mann-Cynthia Weil-Phil Spector song making noise for The Righteous Brothers at the start of '65. The plan backfired...just an eentsy-weentsy bit...it peaked at number two before the Righteous original leapfrogged into the top spot. She performed beau Bobby's song "Is It Love" in the Gerry and the Pacemakers film Ferry Cross the Mersey, a U.S.-only single that somehow fell through the cracks. Cilla was put off by Randy Newman's goofy voice on the demo of "I've Been Wrong Before" (we Yanks have have since been conditioned to the way he sounds), but recorded the song anyway (Newman loved it) and debuted it in America on an April 1965 installment of ABC-TV's Shindig. "Love's Just a Broken Heart" was a biggie back home, but in America only one other song managed a chart placement. Cilla wasn't wild about Bacharach's "Alfie" (the title theme for the movie that established Michael Caine's star presence), but Burt talked her into it by traveling to England to produce and arrange the session...yet a cover by Cher was featured over the film's closing credits, while the U.K. edit used That Was the Week That Was gal Millicent Martin's version. Still, Black's take hit the U.K. top ten in the spring, while Capitol waited until summer to pit hers against Cher's much more successful recording. 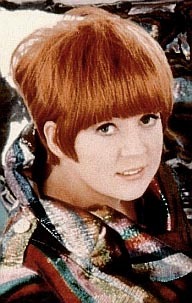 Cilla hit an emotional bump in the road when Brian Epstein passed away so suddenly in August '67 at age 32; nevertheless, her hit string continued in Britain while a few final U.S. releases on Capitol, several on Bell and DJM in the late '60s and a more extensive set on EMI from 1974 to '78, failed to sell. In 1968 she gave serious acting a try with a role in Work is a 4-Letter Word while another Lennon-McCartney composition, "Step Inside Love," placed her back in the U.K. top ten. Other big hits included "Surround Yourself With Sorrow" and "Conversations" in '69 and "Something Tells Me (Something's Gonna Happen Tonight)" in 1971, the latter two penned by Roger Greenaway and Roger Cook, who recorded in the mid- to late-'60s as David and Jonathan. Parlophone was dissolved in 1973; Cilla continued recording for parent company EMI with minimal success. Later she made a handful of records for Towerbell in the mid-'80s and Sony's Columbia label around 1993. Her career transitioned from singing to television hosting; in 1969 she had married longtime boyfriend Bobby Willis, who produced the series Cilla's Comedy Six in 1975 and Cilla's World of Comedy in 1976; their 30-year marriage lasted until his death at 57 in 1999. Cilla Black's longest gig was as the host of the game show Blind Date from 1985 to 2003, a Brit equivalent to America's The Dating Game.